Tasty fried snacks and pretending your living room is suitable for a passed-app event are definitely happening again this year. 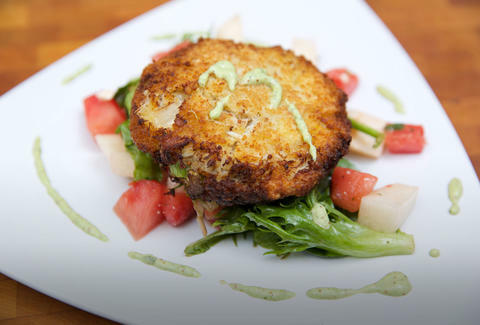 So do yourself -- and your family, who strangely turn into a pack of ravenous hyenas for the month of December -- a favor and invite jumbo lump to the party with this killer crab cake recipe from Top Chef season one winner Harold Dieterle. To make the crab cakes, heat the blended oil in a medium sauté pan over medium heat. When the oil is shimmering, add the onion and celery and cook, stirring, until the vegetables are softened but not browned, about 2 minutes. Stir in Old Bay and remove the pan from the heat. 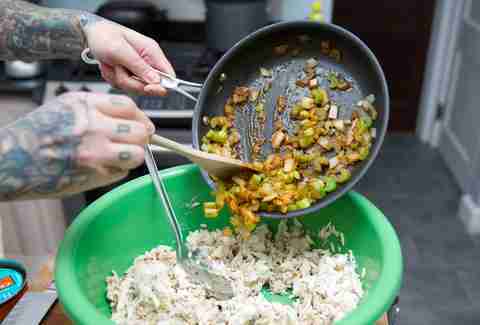 Transfer the mixture to a large temperature-proof mixing bowl and set aside to cool slightly. Refrigerate until chilled, about 15 minutes. Meanwhile, make the jicama salad. Put the cider vinegar, olive oil, and sugar in a medium bowl and whisk until the sugar dissolves. Add the jicama, jalapeño, radishes, red onion, carrot matchsticks, and cilantro and toss well. Season with salt and white pepper, and toss again. Set aside. When the onion-celery mixture has chilled, use a rubber spatula to fold in the mayonnaise and mustard, then fold in the crabmeat; the mixture will look like a loose crab salad. Form the crab mixture into 8 balls, each about the size of a baseball. Put the flour in a medium bowl. Put the eggs in a second medium bowl and beat them to blend. Put the bread crumbs in a third medium bowl. Dredge the balls first in the flour, then in the egg, and finally in the panko, generously coating them. While they are in the panko, use your hands to press each ball into a 5-inch cake, about 1 inch thick, and transfer to a large platter. Position a rack in the center of the oven and preheat the oven to 400 degrees. Line a baking sheet or platter with paper towels and set it aside. Heat a large, deep sauté pan over medium-high heat and pour in enough blended oil to come 1 inch up the sides of the pan. When the oil is shimmering but not smoking, add the crab cakes in batches and cook until golden brown on the bottom, about 3 minutes. Gently turn the crab cakes over and cook until golden on the other side, about 3 minutes more. Transfer the crab cakes to the prepared baking sheet or platter and season immediately with salt and white pepper. Transfer to a clean baking sheet without crowding. Once all cakes have been pan-fried, bake until they are heated through, about 2 minutes. Now make poblano remoulade. Add 2 roasted, peeled, seeded, and diced poblano peppers to a food processor along with 2 fresh large egg yolks, 2 cornichons, 1 tablespoon of freshly squeezed lemon juice, 1/2 tablespoon Dijon mustard, 1/2 teaspoon of capers, 1 teaspoon of cayenne, 1 1/2 cups blended oil, salt, and pepper, and blend to a smooth consistency. To serve, divide the jicama salad among 4 plates. Place 2 crab cakes on the side of each salad, and drizzle the cakes with the remoulade.